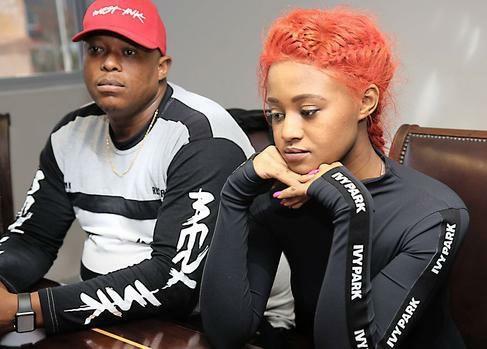 The self-proclaimed Queen of Gqom Babes Wodumo exposed on Metro FM earlier on Friday afternoon that she had split with her longtime beau, Mampintsha, a member of the award-winning Kwaito group Big Nuz. During an interview with Metro FM’s drivetime show with Masechaba Ndlovu and DJ Mo Flava, the fiery Ndlovu revealed that she was aware that Babes Wodumo was physically abused by her long-time partner. The engagement with Mampintsha is over. They are no longer a couple. "We were engaged but not anymore," said Babes. Mampintsha apparently used Babes Wodumo’s Instagram account to post a picture that suggested the two were still an item. This as rumours of the couple’s split had begun to surface in some social media corners earlier in the week. Babes said: “There are lots of things that happened. He sometimes posted on my Instagram account. He has access. When you love someone you give them everything,” she said explaining why Mampintsha had her social media passwords. Babes Wodumo also revealed she has a new man in her life, but true to form, she would not reveal who this was. “People will see soon,” she said when asked who this person was. When the hosts threw some names, namely that of Brilliant Khuzwayo, the departing Kaizer Chiefs goalkeeper, Babes Wodumo said he was just a “friend”. Babes Wodumo has also started her own record label, to which, it is apparent she is the only artist. The name of the record label is “Wodumo Entertainment” and she is working on an album which she said would be fire. Confronted with questions about Mampintsha’s alleged abuse, Babes Wodumo said very little, but it was Ndlovu who did most of the talking. Earlier, when pressed about the split, her response was: “We have given each other space to do whatever each of us wants to do. He must live his life and not live through me (financially and otherwise)”. Despite their split, and alleged abuse claims against Mampintsha, the two were still business partners outside of the music, Babes said. The details on the business partnerships were not made clear, but she could be referring to a clothing apparel business. "I respect him, we work together. Things are sour at the moment,” said Babes. Finally, when Ndlovu made the revelations of Mampintsha’s alleged abuse, Babes was asked what she would do, she replied in isiZulu: “God will fight my battles”. She revealed that she had moved out of his Westville home and had gone back to her parents’ home in Lamontville, a township south of Durban. Mo Flava then asked the starlet was doing about the alleged abuse, to which an emotional Babes responded: "I don't know". Ndlovu consoled her and urged her to get a restraining order because: “I hate to see young women living in fear… You are sitting here, you are scared… I see you are still suffering,” said Ndlovu.